The rural population of developing countries exhibit unique resource optimization capabilities as compared to urban populations. Tracts of land are cultivated and cattle are reared and the produce is sold off in the market or consumed. The wastes generated from crop cultivation and rearing animals are also utilised domestically. While the dung of animals is converted to dung cakes and used as fuel in inefficient cooking stoves (chulhas) and domestic heating in winters, the crop residues are usually burnt off so as to reduce the costs involved in storage, handling etc These activities are wasteful, uneconomical and bear a huge impact on the health of people who come in direct contact. Burning of crop residues leads to the release of several atmospheric pollutants such as aerosols, suspended particulates, SOx and NOx and in some cases dioxins and furans. Further, burning of the standing crop also leads to volatilization of the soil nutrients, decreasing soil fertility. Dung cakes are extremely popular for cooking purposes in rural areas. Burning of dung cakes leads to toxic emissions in the form of SPMs, PAHs and CO. Studies relate cow dung cake burning with cases of tuberculosis, lung cancer etc. Thus, the external costs (environmental damage, soil damage, health damage) associated with the traditional methods are enormous. The risks associated with the problem indicate long term losses in terms of health, environmental loss and degradation of land. There is an urgent need to switch over to greener solutions for the sake of rural development. Anaerobic digestion has the potential to meet the energy requirements of rural India, and also counter the effects of reckless burning of biomass resources. In Indian context, the Deenbandhu model is the most economical anaerobic digester. It was developed by Action for Food Production (AFPRO), New Delhi, India, in 1984. This model is designed on the basis of the principal of minimization of the surface area of a biogas plant to reduce its installation cost without sacrificing the functional efficiency. The design consists of two concrete spheres of different diameters, joined at their bases. The structure thus formed acts as the digester or fermentation chamber, as well as the gas storage chamber. The digester is connected with the inlet pipe (coming from slurry mixing tank) and outlet tank (for collection of digested slurry). The selection of the size of biogas plant to be installed depends upon the number of persons to be served or availability of feedstock. About 25kg of dung is required per 1m3 of biogas production. The resultant bio fuel i.e. 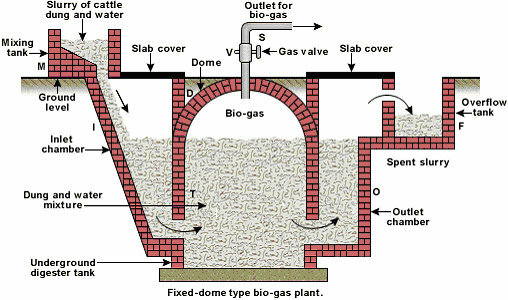 biogas has high calorific value and produces little pollutants on burning. Anaerobic digestion proves to be a beneficial technology in various spheres. Biogas produced is a green replacement of unprocessed fuels (like fuel wood, dung cakes, crop residues). It is a cost effective replacement for dung cakes and LPG (wherever used). A study conducted in rural households in Patiala, present in the state of Punjab in India, reveals that 1 m3 of biogas equals 0.43 kg of LPG. The yearly income from a 1m3 biogas plant, thus, amounts for Rs. 1821, which is a considerable amount for low income level farmers. An additional benefit is that the quantity of digested slurry is the same as that of the feedstock fed in a biogas plant. This slurry can be dried and sold as high quality compost. The nitrogen-rich compost indirectly reduces the costs associated with use of fertilizers. It enriches the soil, improves its porosity, buffering capacity and ion exchange capacity and prevents nutrient depletion thus improving the crop quality. This means increased income for the farmer. Further, being relatively-clean polluting cooking fuel; biogas reduces the health risks associated with conventional chulhas. Thinking regionally, decreased residue burning brings down the seasonal high pollutant levels in air, ensuring a better environmental quality. Anaerobic digestion thus proves to be more efficient in utilization of crop residues. The social benefits associated with biomethanation, along with its capacity to generate income for the rural households make it a viable alternative for conventional methods. 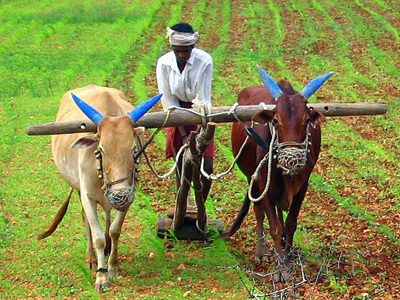 However, the farmers are largely unaware of the possible ways in which farm and cattle wastes could be efficiently utilized The government agencies and NGOs are major stakeholders in creating awareness in this respect. Moreover, many farmers find it difficult to bear the construction and operational costs of setting up the digester. This again requires the government to introduce incentives (like soft loans) and subsidies to enhance the approachbility of the technology and thus increase its market diffusion.